The reviews are in, and they are good! In keeping with the growing trend of juice bars springing up across the country, customers are lining up to sample — and re-sample — the range of choices at Arlee’s Raw Blends. Opened in April at 246 Nassau Street, the new juice bar is owned by the brother and sister team of Brian Moore and Paula Taylor. Their establishment, with its emphasis on cold-pressed juice and natural and organic ingredients, is special, they maintain. Their background includes spending summers at their grandparents farm (owned by the family for three generations) in Georgia, and a familiarity and love of fresh produce and healthy eating. The juice bar is named for Mr. Moore’s wife, Arlee, who was the inspiration for the business, says Mr. Moore. “My wife was looking for natural juices, and she felt there was a need here. In addition to spending time at the family farm, I have a food background. I went to the University of Maryland, and got a degree in business administration, with a focus on food and beverages. 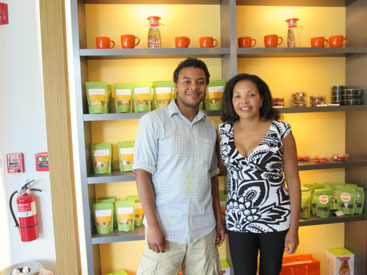 Having their own place and storefront in Princeton was a goal for Ms. Taylor and Mr. Moore, who grew up in the area. When the location of the former Allstate Insurance office became available, they decided to take the plunge. It required a total renovation of the space, and they — and the customers — could not be happier with the outcome. In addition, what further sets Arlee’s Raw Blends apart is its cold-press method, explain the owners. The juices are cold-pressed daily from 100 percent organic fruits and vegetables and immediately glass-bottled. And, as they point out, “We get our fruits and vegetables locally as much as possible. Using locally-grown 100 percent organic produce means a fresher and tastier juice. It’s better for our economy and better for the environment. Juices are available in more than two dozen blends, including lemon, lime, beet, pineapple, watermelon, apple, carrot, turmeric, chia, and three kale blends. Also offered are raw cacao blend, cold brew latte, cold brew coffee, cafe mocha blend, and a variety of almond blends. Super Food smoothies are also popular, and include added fiber ingredients, such as maca, hemp seeds, spiralina, acai, coconut oil, and made in-house almond butter, which can be added to any of the juices. Among the juices, kale is the number one seller, notes Ms. Taylor. “Kale is a signature item for us. Even teenage boys love it! Everyone should start their day with kale! It’s a real energy-booster, and it stays with you all day long. In addition to the juices, Arlee’s Raw Blends offers fresh cut fruit, salads, veggie chips and crackers, mixed nuts, and a variety of dehydrated items, such as watermelon jerky, berries, and other fruits and vegetables. A variety of fresh salads is also available, as are dips, kale pesto, raw cacao truffles, and a big favorite — the vanilla bean cheesecake. Ms. Taylor and Mr. Moore are delighted with the enthusiastic response from customers of all backgrounds and ages (“kids to retirees”! We have two flavors created with kids in mind: the ‘Kale Refresher’ and the ‘Apple Refresher’). People come in throughout the day for their favorite juice “pick-me-up”. Juices are available in 8-ounce bottles for $6 and 16-ounce bottles for $10. Specials are offered in which customers can pre-pay for 16, 24, 32, or 64 bottles, and receive a savings of up to $64. If they buy six or more bottles, they will receive a free cooler bag. Arlee’s Raw Blends also offers books on healthy eating and juicing. Hours are Monday through Friday 6:30 a.m. to 8 p.m. Saturday and Sunday 8 a.m. to 7 p.m. Free delivery is available locally between 6 a.m. and 9 a.m., with a $40 minimum. (609) 580-1899. Website: arleesrawblends.com.